When I first saw Therese's card, my jaw dropped and I wondered how on earth I could do justice to it - not once, but twice. Once for the initial challenge post and once for the reminder post. Well, here's my second card where I was once again inspired by the pinks, the layout and this time I also added some ombre. 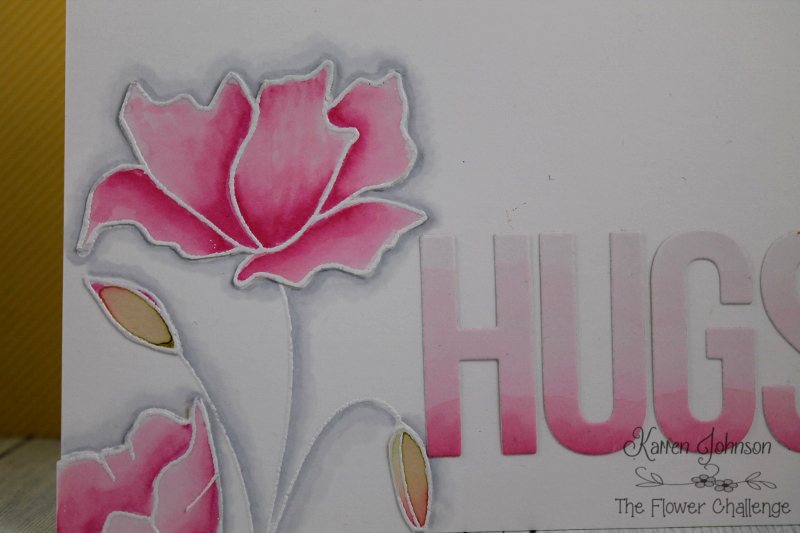 I stamped the NBUS floral image onto watercolor card and white embossed it. I then colored it with Zigs. I actually completely ruined the first attempt by putting a grey wash all around the image, so I salvaged the flowers and buds by fussy-cutting them and then re-stamped and embossed the image onto another panel. The flowers and buds were then adhered over the top. This time I used a couple of grey Copic markers to provide a bit of subtle shading. The sentiment was cut from a panel that I'd loosely colored some pink Zigs onto and adhered to the card base. Thanks for visiting! Head on over to the challenge blog and check out what the rest of the DT have come up with and huge thanks to Therese for joining us this month. This is just lovely, Karren. 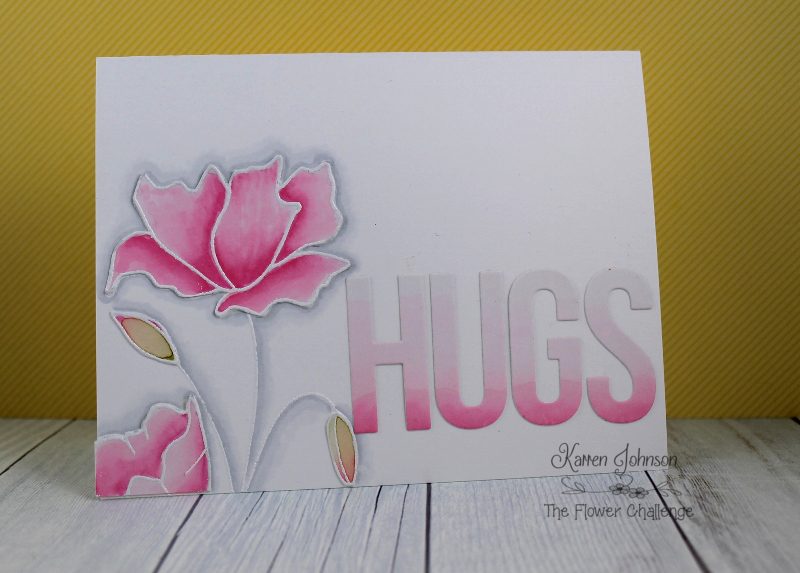 Love how the HUGS Die-namics matches the scale of that gorgeously coloured and shaded Penny Black flower image. The ombre is a nice touch that adds even more beauty to your card. Oh the shading......oh the colors.....oh you are amazing girl! Love this! Such a gorgeous bloom, and once again, I love the ombre effect you created for the die cut sentiment! I also love how you added subtle shading with your soft gray Copics...so pretty! A really stunning take on Therese' inspiration card...WOW! WOW, this looks absolutely wonderful, Karren!!!! Beautifully done!!! Wow, these cards are beautiful! Your negative and your touch of color on your word are fabulous! Wow! Just wow! The flower is amazing and I love how the ombre theme carries from the flower on to the sentiment. wow Karren...this is amazing and so beautifully done. Love the grey halo around the flowers and the way you did the sentiment...outstanding card mf. Both of these cards are just stunning Karren! I especially love your first card - it's so soft and delicate! Karren, so sorry for my late comment on your card. I love this flower, should have bought it. Bought the stencil but the stsmp would have been better. What a stunner your card is, the pink really highlighted by the grey surround. Thank you for finding the time to make a card for the reminder, as always so very appreciated.